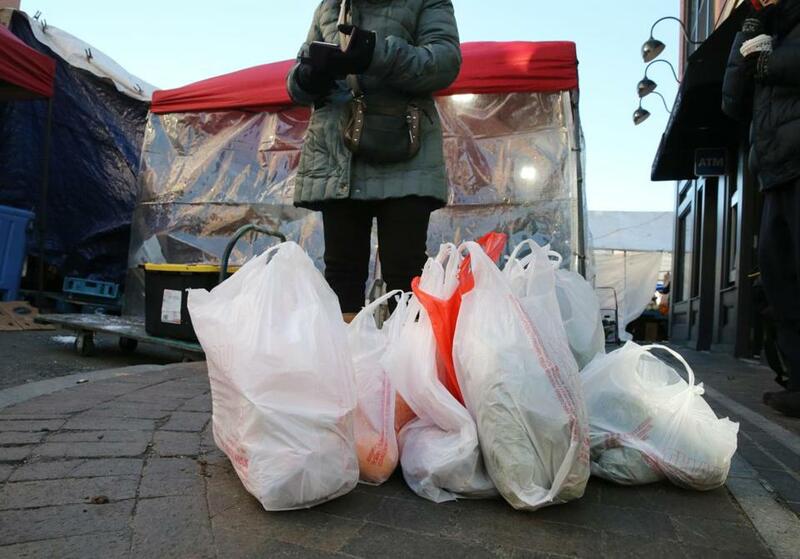 Single-use plastic bags will be restricted in Boston come Dec. 15. A website explaining Boston’s ban on single-use plastic bags is on its way. City Councilor Matt O’Malley on Thursday gave environmental officials a month to launch a website about the new ordinance, which takes effect Dec. 15. “We need the website up as soon as humanly possible,” O’Malley said during a City Hall meeting about rolling out the new rule. The measure is designed to encourage shoppers to use environmentally friendly alternatives such as reusable bags, or pay a 5-cent fee for a compostable plastic bag. Shoppers would also be given the option of paying a 5-cent fee for larger paper bags with handles. Mayor Martin J. Walsh signed the provision in December after the City Council adopted it unanimously. The ban has generated concerns that low-income residents and senior citizens would bear the financial brunt of the new measure. During the session organized by O’Malley and Councilor Michelle Wu, representatives of the Commission on Affairs of the Elderly and the Environment Department discussed ways to spread the word. O’Malley inquired about mailing out information about the ordinance along with property tax bills. He suggested that the city ask large retail chains to provide resuable bags and floated the idea of establishing drop-off sites where residents could donate bags they don’t need. Emily Shea, who leads the elderly commission, said information about the ban will be included in the free magazine Boston Seniority, which has a circulation of 15,000 copies, and will be posted on Facebook and Twitter. The commission is considering a public service announcement and plans to work with the Boston Housing Authority to inform older residents about the rule, Shea said. Wu suggested that the city develop materials explaining the ordinance that could be displayed in businesses. Officials in Cambridge, which enacted a plastic bag ban in 2016, have offered to share the notices they used to inform businesses and residents, Wu said. Retailers who flout the ordinance would be issued a warning. If another violation occurs within a year of the warning, a $50 fine would be levied, followed by $100 fines for subsequent offenses. Carl Spector, commissioner of the Environment Department, said the city is looking at assigning enforcement duties to the Inspectional Services Department, which has inspectors who visit businesses to make sure they comply with other rules. Another meeting about implementing the ban is planned for April.